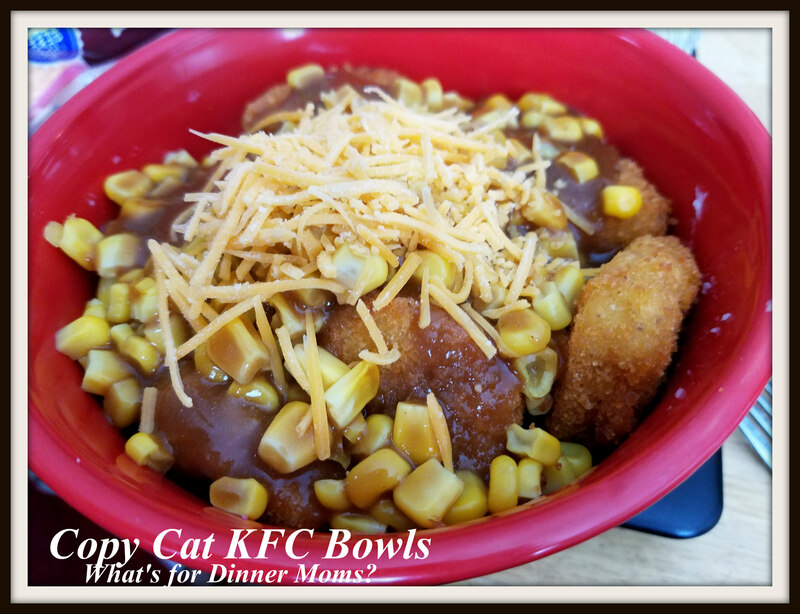 Copy-Cat KFC Bowls – What's for Dinner Moms? We were having a bad day and I was going to take my son over to KFC to pick up lunch. The kids had a half day for mid-terms and wanted a hearty lunch. I decided instead to stop at the grocery store to pick up the ingredients for the bowls that he likes so much. One bowl at KFC with a drink is $5 but I fed all four of us for $7.65! The chicken nuggets were on sale for $3.99 for a 2 lb. bag. We prefer the popcorn chicken in this bowl but for $3.99? We made do. A can or corn, 1 packet of instant gravy, and a family sized package of instant mashed potatoes completed the grocery shop. We already had some cheddar cheese at home to sprinkle over the top. Everyone was happy with the results. 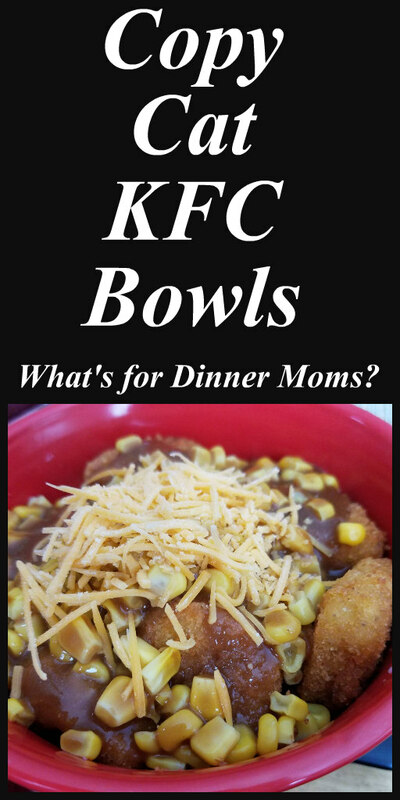 At $5 a bowl at KFC or $7.65 at home? I am taking the $7.65! I had my son make lunch and he was surprised at how easy it was. He said the hardest part was measuring the water for the gravy and mashed potatoes. If you like you can make homemade mashed potatoes or use leftovers if you have them. Also, the chicken can be homemade rather than frozen but we were going for ease of preparation yesterday. A simple hearty meal that can fill in for takeout. Prepare chicken, mashed potatoes, gravy, and corn according to package directions. Assemble bowls with mashed potatoes on bottom, corn, chicken, and then gravy over the whole dish. Sprinkle with cheese if desired. Serve hot.